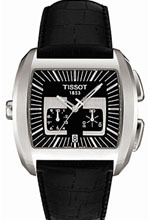 Description : Swiss Made quartz movement with Hour, Minutes, Seconds, Date. Chronograph functions: 1/10 of a second counter, 30-minute counter, central 60-seconds chronograph hand, ADD and SPLIT functions. Water-resistant to 30m/100 ft. Domed scratch-resistant sapphire crystal. Stainless steel case.